The East Marsh is a world area in Act 1. it is a large side area that connects to Mud Row and Craig's Crags. Although located in Act 1, it is usually necessary to have completed at least some of Act 2 to access, as Dynamite is required to repair the bridge (Dynamite drops in Act 1 are possible...... This complementary guide has info on all the side quests, obstructed paths, Mishy's hiding places, animal locations, memory locations, and contains screenshots from all the maps (including the location of every treasure chests and resource points). This complementary guide has info on all the side quests, obstructed paths, Mishy's hiding places, animal locations, memory locations, and contains screenshots from all the maps (including the location of every treasure chests and resource points).... Treasures from the Royal Archives is at Windsor Castle from 17 May 2014 until 25 January 2015. The book of the same title (240 pages and over 120 colour illustrations) is published by Royal Collection Trust in May, price £19.95 from Royal Collection Trust shops and £29.95 from all good bookshops. The Dawning Armor Set. This set of illuminated armor that has been shown off in many of the trailers for Destiny‘s latest live event is available only through Treasures of the Dawning.... 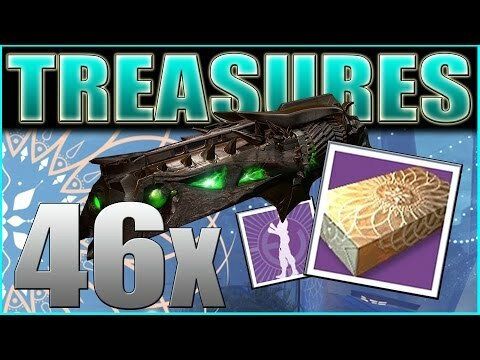 Treasures of the Dawning in Destiny. “A box of Eververse treasures to celebrate the Dawning and the new year.” A mystery bag that can be opened for a variety of new ornaments, sparrows and emotes. Treasures of the Dawning is a consumable mystery bag introduced in the Destiny: Rise of Iron event The Dawning. It was later replaced by Treasure of Ages in Age of Triumph. One of the following: It was later replaced by Treasure of Ages in Age of Triumph.... Treasures of the Dawning is a consumable mystery bag introduced in the Destiny: Rise of Iron event The Dawning. It was later replaced by Treasure of Ages in Age of Triumph. One of the following: It was later replaced by Treasure of Ages in Age of Triumph. For Destiny on the PlayStation 4, a GameFAQs message board topic titled "Treasures of the dawning ornaments". Destiny 2’s The Dawning is this year’s Christmas event, returning from the original Destiny. Fans of SRL will be disappointed, with the event dropping Sparrow Racing League in favour of new Milestones for existing events, and the chance to give gifts to vendors for rewards in return.